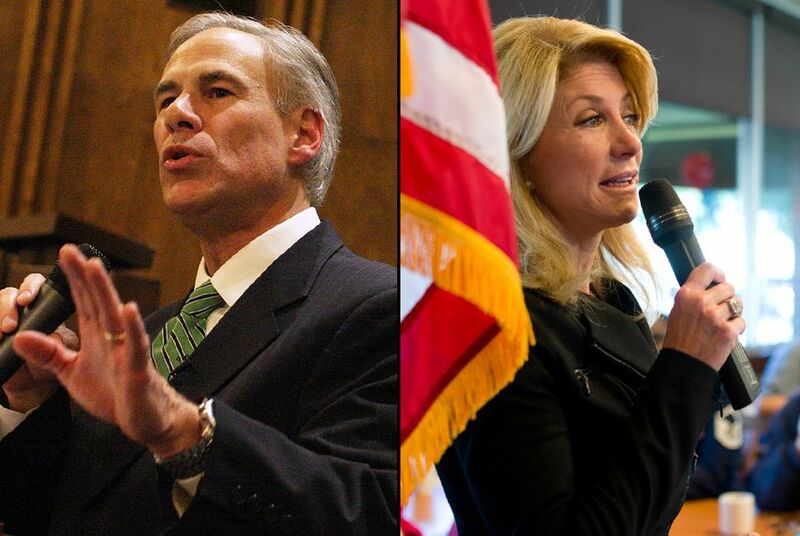 In the latest iteration of the fight over women's issues in the Texas governor’s race, Republican Attorney General Greg Abbott and his Democratic opponent state Sen. Wendy Davis are sounding off over equal pay. In the latest iteration of the fight over women's issues in the Texas governor’s race, Republican Attorney General Greg Abbott and his Democratic opponent, state Sen. Wendy Davis, are sounding off over equal pay and whether Texas needs its own version of the federal Lilly Ledbetter Fair Pay Act. Davis' camp has attacked Abbott in recent weeks for defending the state in an equal pay lawsuit, slammed him for not giving a clear answer on whether we would have vetoed the Texas version of act (which Gov. Rick Perry did), and gone after the long-serving attorney general for disparities in pay among top workers at his agency. They have also decried comments made by Republican spokeswomen in recent TV interviews that seemed to put the onus for equal pay on women. The Abbott campaign tried to take control of the message on Wednesday, suggesting that Davis was practicing “equal pay hypocrisy,” and saying that through her law firm, Davis serves as counsel to the Tarrant Regional Water District, which was previously accused of gender pay discrimination under the Lilly Ledbetter Act. "Sen. Wendy Davis has now mastered the Texas two-step as she continues to launch attacks over equal pay while shielding her own record of defending gender discrimination,” Abbott spokesman Matt Hirsch said. The Davis campaign fired back that the senator serves as minority bond counsel for the district, and only advises the public entity on issuing municipal bonds, which the Tribune has previously reported. Davis communications director Zac Petkanas called Abbott's response “a pathetic distraction” given the report on equal pay in his own office and added that the case against the district was dismissed because it was past the statute of limitations. Current state law requires disparate pay claims to be made within 180 days after the discrimination began, whereas the federal Lilly Ledbetter Act allows such claims to be filed when discrimination is discovered. A Texas version of the federal law that aimed to extend the statute of limitations, which Davis sponsored in the Senate during the last legislative session, was vetoed by Perry because he said it duplicated federal law. "Is it now Greg Abbott's position that a state equal pay act is needed?” Petkanas asked. On Wednesday, Hirsch said Abbott would not have signed the law "because wage discrimination is already against the law and because legal avenues already exist for victims of discrimination." The latest back-and-forth is a continuation of sparring over fair pay that began when Davis attacked Abbott for not giving a clear answer on whether he would veto the Texas version of the Lilly Ledbetter Fair Pay Act during an interview with WFAA. Davis has also highlighted Abbott's involvement in a fair pay court battle, saying that as Texas' attorney general, he defended the state against a lawsuit filed by a female professor at Prairie View A&M University who alleged discriminatory pay on the basis of race and nationality. She was unable to pursue her case because the Texas Supreme Court ruled that federal law didn’t apply to the state’s statute of limitations, which the AG’s office argued had expired. And they have gone after Abbott for equal pay in his office, citing an analysis by the San Antonio Express-News that showed that most female assistant attorneys general make less on average than men in the same positions. The attorney general’s office said the difference is linked to the amount of time the male employees have served at the agency and how long they’ve been licensed to practice law. The analysis also did not include a breakdown of salaries in Davis’ Senate office. The Republican response to the equal pay debate this week gave Democrats even more campaign fodder. In a TV interview on YNN Capitol Tonight this week, Texas Republican Party Executive Director Beth Cubriel said that “men are better negotiators” than women in the workplace and encouraged women to “become better negotiators” rather than pursuing equal pay action through the court system. And in a WFAA interview, Cari Christman, the chairwoman of the RedState Women political action committee, suggested that women are too busy with work and advanced degrees to fight equal pay in the courts, and instead want “practical” solutions. Davis spokeswoman Rebecca Acuña called the remarks “out of touch” and “offensive." “Here's a newsflash for Greg Abbott: Women aren't too busy to fight for economic fairness for all hardworking Texans and they aren't too busy to reject his business as usual opposition to equal pay legislation at the polls next November,” Acuña said. Abbott has said he supports equal pay for women but has added that there are already laws in place to protect women in the workforce, citing state statutes and constitutional protections against gender discrimination. The Abbott campaign has yet to respond to requests for comment on whether the attorney general agrees with the televised remarks.